Tangled and True: natural pod. Christmas shopping for Finn is proving difficult this year. He doesn't really need anything and he's not old enough to want anything, still I feel a need to have him represented under the tree. Natural Pod has always been a favorite shopping spot. Their selection of natural and wooden toys is one of the best I've found. I think this wooden bus might be a perfect fit for Finn. Something he can use now and as he grows. I'm also on the lookout for some great wooden blocks. Suggestions are welcome! 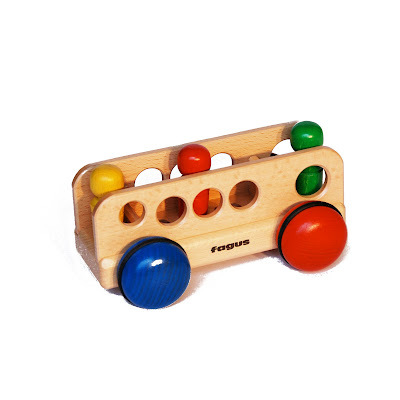 Community Playthings has great wooden blocks and wooden vehicles. Haba has good looking colored blocks and we like their soft wonder dice. My boys love the Melissa and Doug blocks. They feel so good in your hands! Brittany! Have you found wooden blocks yet? We have a set from Nova Naturals --- easy for little hands to hold and build with. We love them!